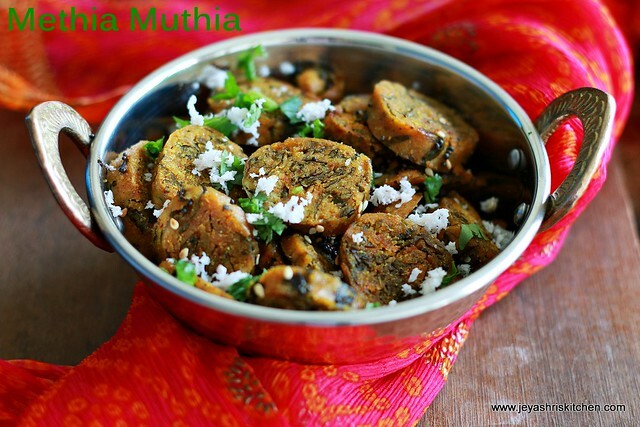 Muthia is a healthy gujarati snack, generally made with palak, methi, cabbage or lauki too. A diabetic friendly recipe and also no compromise in taste too. Generally to make this we use besan | kadalaimaavu and wheat flour. 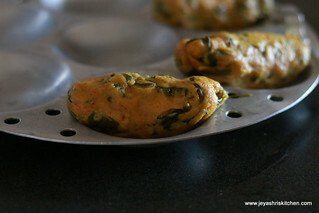 I used jowar flour and bajra flour to make this methi muthias. It turned so well and you can also replace the flours too if you want. 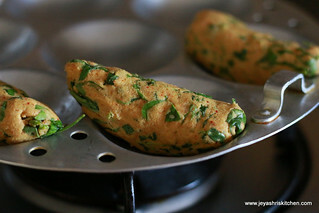 Even you can use any millet flours to make this muthia. 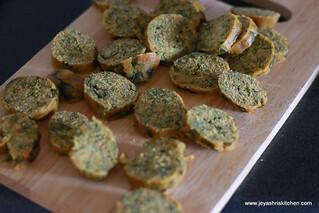 A very healthy and yummy snack which can be made easily. 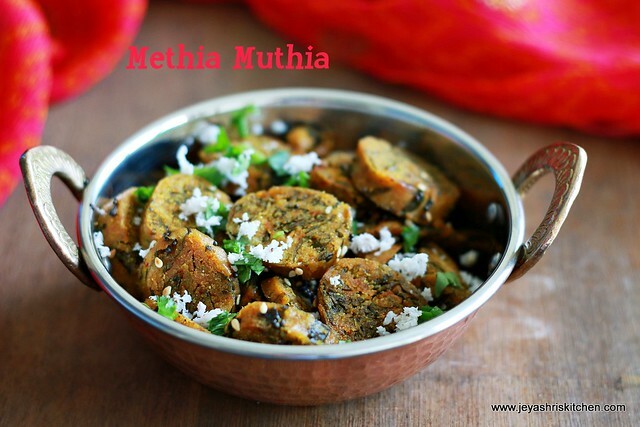 Try out this traditional gujarathi Methi muthia recipe. 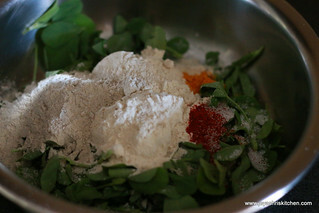 In a wide bowl, add the methi leaves (washed and cleaned) jowar flour, bajra flour, baking soda, red chili powder, sugar, salt and turmeric powder. Add the yogurt and sprinkle little water and knead this into a soft dough. If you feel it is very watery add 1 tblsp of any of the flour. 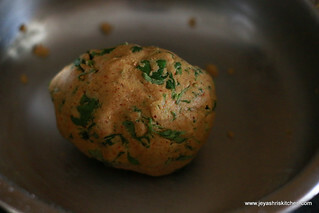 Divide the dough into 2 or 3 equal parts like a log and grease an idli plate. Steam this for 20 minutes. If you insert a clean tooth pick if it comes out clean it means the dough is perfectly steamed. Once it is done allow this to cool completely. Once cool, cut them into small 1 inch roundels. In a pan, add oil and mustard seeds and add the cut roundels. Let this become nice golden brown colour in a low flame. Add the sesame seeds and cook for some more time, for 7-10 minutes. Methi muthias are ready to serve. Serve hot with green chutney if you like. I just liked it as. 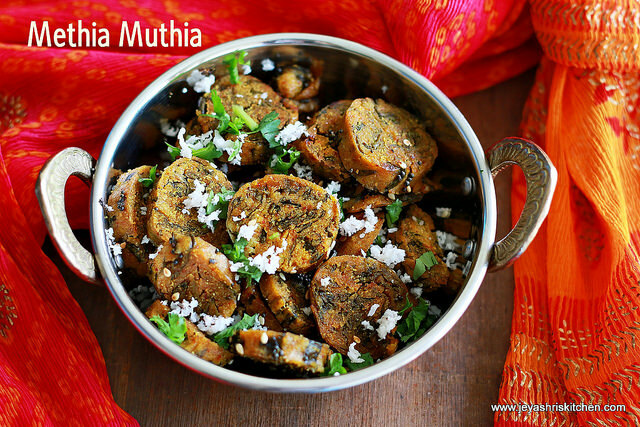 A cup of chai will be a perfect combo with muthias. 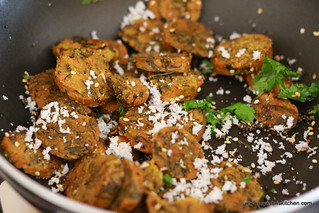 If you are making with cabbage or lauki just grate the vegetable and add salt and keep it aside. Squeeze the entire water nicely and then add instead of methi. Instead of jowar flour and bajra flour you can add besan | kadalai maavu and wheat flour. Palak also can be replaced with methi leaves. Instead of red chili powder you can add freshly ground green chili and ginger. very healthy dish!!! 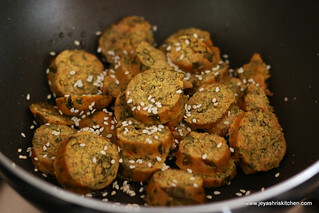 I have made muthias with carrot, methi is a nice idea! !